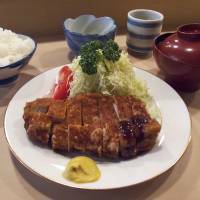 Nowhere does tonkatsu like Tonki. Of all the restaurants in Tokyo that serve those ever-popular cutlets of breaded, deep-fried pork — and they number in their thousands — nowhere stands out quite the way Tonki does. To its legions of fans, it is an all-time classic. Others say it’s an old-fashioned relic, and don’t see what the fuss is about. But on whichever side of that divide you stand, there’s no denying that after more than seven decades in business, Tonki is a veritable institution. 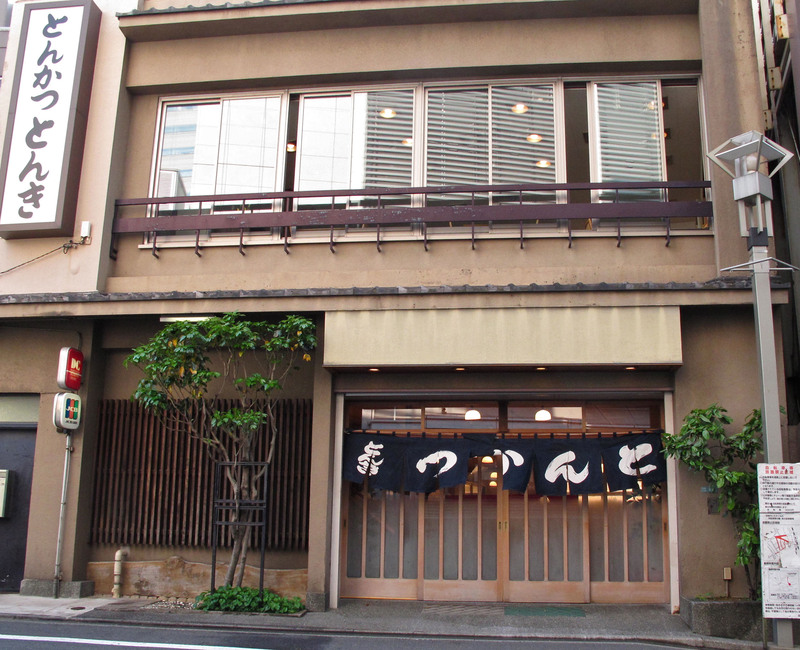 From the outside it looks simple, traditional, readily overlooked, especially now it’s overshadowed by the soaring new Meguro Hilltop Walk tower. But once you slide aside the well-worn wooden doors, duck under the short indigo noren curtain and step inside, you realize it really is one of a kind. The first thing that hits you is how large it is, or rather how open and spacious. It’s a big room, but the layout, the brightness of the lights and the lack of any decor make it feel even bigger. There are no tables, just a single counter running three sides of a kitchen that is spotlessly clean and takes up two-thirds of the floor area. This is the way people dined back in 1939 when Tonki was founded, though the current building dates from the 1970s and sports the kind of plain fittings you’d expect in a municipal hall in the furthest provinces. Were it not for all the timber furnishings and the beautifully smooth whitewood counter, it would feel as spare and institutional as an old-school soup kitchen. The next thing you notice is the quiet. Apart from the shouts of greeting as customers enter, and the orders called out from one side of the room to the other, all you hear is the constant bubbling of the oil in the vats in the center of the room. There’s no background music, no boisterous revelry. You are there simply to eat, enjoy and then leave. But before you can eat you must wait. It will take 20 minutes for your food to arrive from the time you place your order. Not that the decision-making will hold you back. 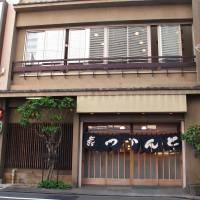 Tonki only serves one thing: No shrimp, no oysters, no noodles, no curry sauce, just its trademark tonkatsu. 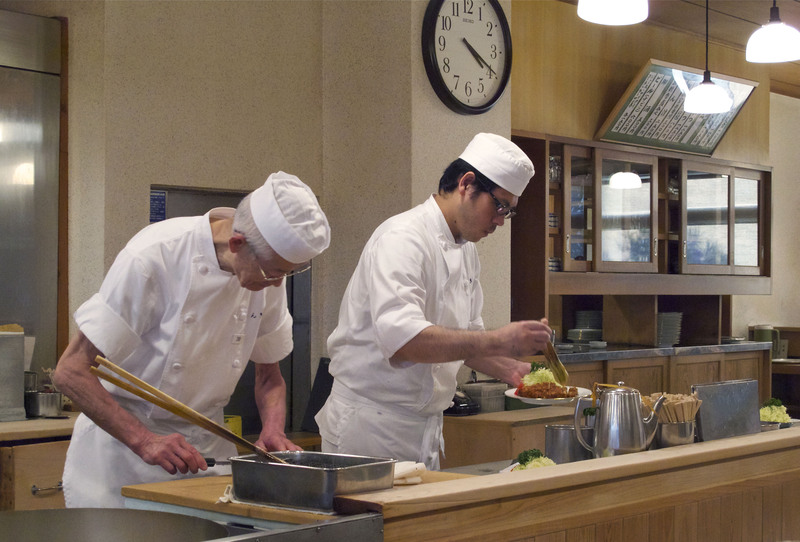 The basic choice is simple: rōsu (fatty pork) or hire (lean) — and rōsu is the more popular here by a margin of over two to one. But there is also a third option: kushikatsu, small cuts of pork (mostly lean but not always), breaded and deep-fried along with chunks of onion. Because you get less meat, this is rarely ordered by aficionados except as a side dish, but it makes for a lighter meal. While you wait, you can order beer or sake, read a newspaper (you will be offered the day’s vernacular tabloids), count the number of lampshades (there are 30), or marvel at the way it barely smells at all of cooking oil. Or you can just sit and watch the team of chefs go about their business. Dressed head to toe in white, they work with the minimum of words or movement and the relaxed assurance that can only come from decades of getting it right. The cuts of pork are dipped in batter, thoroughly covered in fine breadcrumbs, and then eased into the deep-frying oil. Finally ready, they are sliced into bite-sized portions and arranged on the plate with a heaping mound of finely shredded cabbage, a wedge of tomato, an obligatory garnish of parsley and a generous blob of eye-wateringly spicy yellow mustard. The trimmings may be standard but the cutlet itself is anything but. If you’re expecting the coating of breadcrumbs to be golden, light and fluffy, you will be disappointed. At Tonki, the slow cooking process turns the casing dark brown and so crisp it seems almost leathery. It also means the meat inside is not as rich and oozing juices as you might find elsewhere, especially if you’ve ordered the lean meat. This in particular is what polarizes opinions. This is not gourmet tonkatsu of the kind you’d get at the superb Butagumi in Nishi-Azabu, nor the impeccably faultless classic style served at the Maisen chain. Tonki’s take is closer to home cooking, reliable and robust, the way it has always been served. This is only emphasized by the no-frills side dishes of plain white rice, pickles and miso soup — a hearty tonjiru with as much pork in it as tofu — which comprise the teishoku set meal. Even with refills of rice, soup and shredded cabbage — this last may sound boring but it goes perfectly with the tonkatsu, and tastes its best at this time of year — you are unlikely to take more time eating your meal than you spent waiting for it. There is no dessert, no coffee, no dallying. As soon as you are starting to finish up, a fresh oshibori towel will be placed in front of you, both as a courtesy and a nudge. On busy evenings, the bench along the back wall is likely to be full of people waiting for you to pay up and leave. And there is no reason to linger, other than to savor just a bit longer the atmosphere. 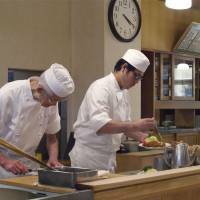 Love it or not, Tonki is a Tokyo institution. And long may it run. 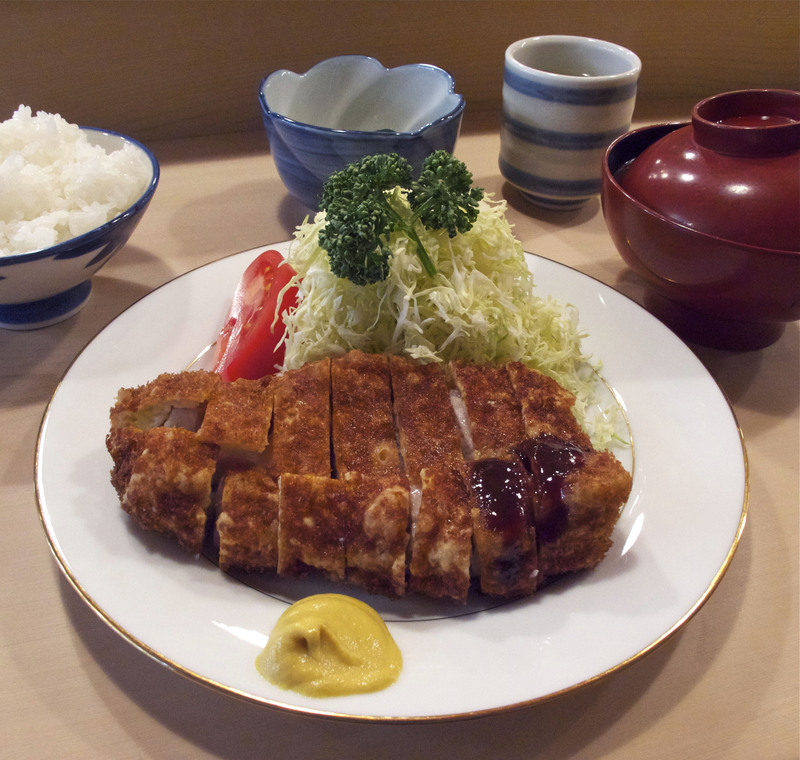 One-of-a-kind tonkatsu in setting to match. It's no place to take your date. 30 at the counter (plus tables and tatami for 40 upstairs). 4-10:45 p.m. (last order); closed Tues. and third Mon. of the month. From Meguro JR Station (West Exit), cross Meguro-dori to the Meguro Hilltop Walk tower. Turn right down the hill, then take the first street to the left by a pachinko parlor. You will see Tonki on your right after about 70 meters, behind the rear exit of the tower.